Your Academy is your personal page which you can use to introduce yourself. Give other users an overview of your past and planned webinars, your ratings, your field of activity and your learning content. Design your academy individually by clicking on "Show settings" on the upper right side to attract the participants’ attention. Academy Title: Fill in the title of your academy. Structure: Set the background colour of your page, the colour of your academy and colour the frame of the boxes if you like. Text: Style the different elements of your text, e.g. the colour of your headings, the links or the text in the boxes. colour field: Move the white framed circle on the desired colour. In the mean field you can move the arrow to the hue you like. 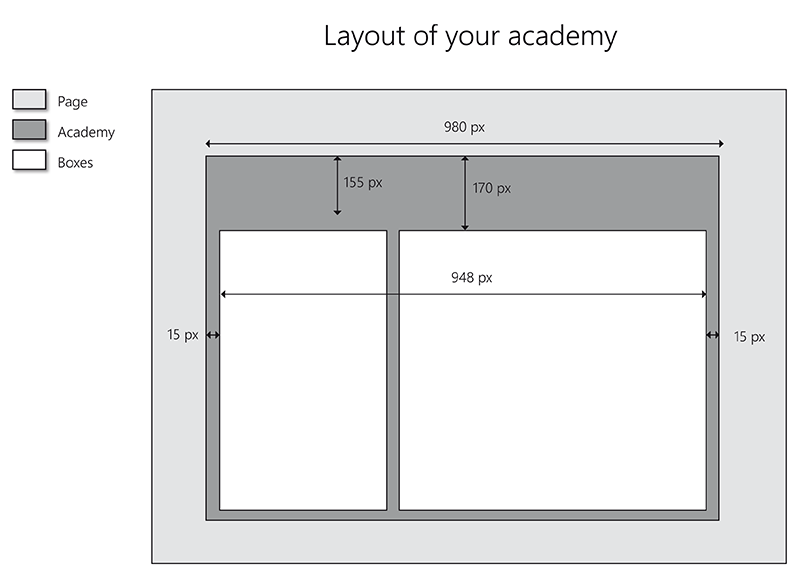 Background image: Set a background image for your academy as desired. You should note that the width of the image is 990 pixels to fill the entire background. Please mind that trainers also have to fill in their legal notice. To create a seminar simply click on the black button in the upper menu. In the next step you have to fill in all the details about your webinar. It is possible to invite contacts comfortably or upload documents. If you want to publish your webinar on the Marketplace, upload an event picture here. You can also change the settings of your webinar after its creation. But from the moment on that a participant registers for the webinar, you can no longer change the date. 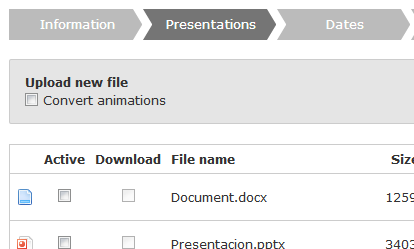 You have the possibility to upload documents like e.g. presentations. These can be Microsoft Office documents, Open Office documents, PDF files, as well as images and graphics. You can upload your files during the creation of a webinar when you click on the button “presentation” in the editing menu of your webinar. Choose the button “browse” to select a file on your PC. Files that are marked as “active” can be called up in the corresponding webinar. Additionally, you can set that your documents are downloadable. Like this, your participants have access to those files and can prepare and work over the webinar. Also after the creation of a webinar you can upload files: Click on “edit” on your webinar page so that you enter the editing menu of your webinar. Before you hold a seminar, you should necessarily make the System Check to test if your bandwidth, your Flash-Player and your sound are sufficient. Moreover we advise you to become familiar with the virtual classroom. If you want to try this, you can create a test webinar which you set as “private”. Only you and persons who got a link from you can see the webinar. You enter the virtual classroom via the button "Enter" on the event page of your webinars. When opening the virtual classroom the Adobe Flash Player asks for your permission to access your microphone and your camera. Allow this access, so you can be heard and seen in the webinar. It's best to be a little early and enter the room a few minutes before the start of the webinar to take all necessary precautions. As long as the webinar has not started, your participants are located in the lobby and can only see the chat. However, you are not visible yet. These minutes you should use to open your presentation through the folder icon in the upper right corner, to welcome the participants in the chat and to check your settings to see whether your sound and your camera image are broadcasted. The webinar will start automatically when the set start time is reached. 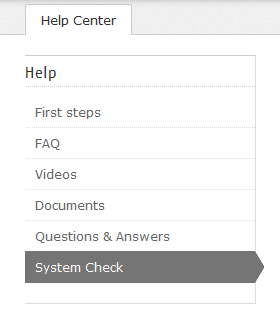 You can also press the "Play" button at the top right to start your online seminar manually. If no participant has entered the room at the start of the event, we recommend that you wait at least 10 minutes before stopping and leaving the webinar. Because of time or technical reasons it is possible that a participant is late. You have the possibility to record your webinars and offer the recordings to your participants or other interested people. Call up the event manager of your webinar. There you can choose under “recording” if you want to record your webinar and for which price you want to sell it. But for participants of a webinar the recording is always free. After the webinar, you can decide whether you want to unlock the recording or not. Click on the button “watch video” on your webinar page. After that a new window with the video opens. Here you can change its name, delete it, request it as a download and publish it with the button “Activate now”. 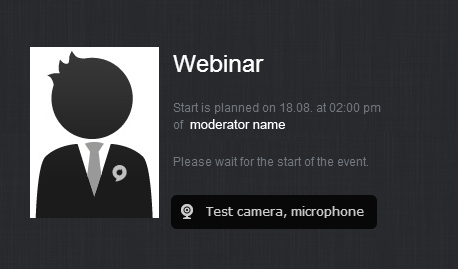 On your event’s detail page there is a button “book”/ “participate”right above the description of the webinar. If your webinar has more than one date, choose your favourite date in the list and then click on the button. If you did not register or sign in before, you have to do this in the next step. Now you have an overview of your webinars and in chargeable webinars, you have to choose a payment method. Fill in your payment data as well as your billing address and accept the terms and conditions after having checked them. To book the webinar bindingly, click on the button “book with costs”. A link to your webinar which you will also get in an e-mail, appears. When your booking is accepted by the trainer, the button “enter room” comes out at your webinar page. With this button you will come into the virtual classroom. Upload a profile photo to make your profile more individual. You can upload a photo under "Contact details" in your settings. Click on the link “edit profile photo” and in the next step on “select image”. Choose your favourite photo but consider that it may have a maximum size of 1 MB. Select the wanted sector and then click on “save image”. The installation of a software is not necessary for the participation in webinars. You only need a PC, a browser which is up-to-date with a Flash-Plugin, an internet connection (minimum 6000 DSL line recommended) and speakers. We advise you to make a System Check before you take part in a webinar, so that your internet connection, your Flash Player, your sound and camera (optional) is checked. If your bandwidth is not good enough, we advise you to use a lan-connection with cable instead of Wi-Fi because a wireless connection can lead to ups and downs. Moreover, the newest version of the Adobe Flash Player should be installed on your PC to avoid problems in the virtual classroom. On the page of your booked webinar there is a button “enter room” with which you come to the virtual classroom of your webinar. To enter the virtual classroom, you have to allow the Flash Player’s settings for your microphone and your camera. Make a check mark in the field. Before the online seminar starts, you are in the lobby. There you can check your camera and your sound if you want to. Moreover, you can communicate with other participants in the chat. When the trainer starts the webinar, all the participants will come automatically into the virtual classroom. After you have taken part in a webinar, you have the possibility to evaluate this event. You have one week to do this, after that the possibility of evaluation ends. To evaluate a webinar, click on the bell on the left side of your name in the menu on top. 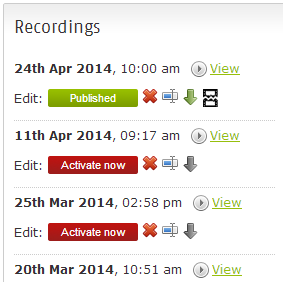 There, an orange number shows you how many events you have not yet evaluated. You can give 1-6 stars for each event. Besides, you can comment on your rating to explain your evaluation. If you don’t want to evaluate a webinar, you have to click on “I don't want to rate it”. For some webinars trainers offer recordings which can be for free or free of charge. When you participated in a webinar which has a video, it is available for free for you. You can find the recordings on the webinar page. When you are logged in, you can see the button “watch video”. When you click on it, the Mediabox will open and on the right side you can see all the recordings the trainer offers for this event. Now you can choose your favourite recording and watch it. If you have already watched a recording, you can also call it up in the list of your watched videos. If you are only interested in a video without taking part in the webinar, you can find the video on the webinar page. Click on “watch video” and you will come to the Mediabox. If the video is free, you directly come to the Mediabox, else you first have to finish the payment process to come to the available videos. Bought videos are always online available for you. Receiving a recording as a DVD or download is unfortunately not possible. 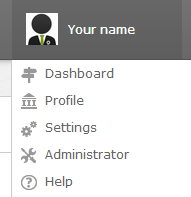 When you have logged in on your own platform, you can set some important settings in your administration under “configuration“. Set a name for your platform, decide whether you want to have an own marketplace or not, and if webinars can be evaluated. You can also select if your platform is public or private which means that users can register or only you can create new users. When you have set your settings as desired, click on the button “save” on the right side at the bottom of the page. Under the menu item “design” you can style your platform individually. You can select the colour of your platform when you click in the colour field. Move the white framed circle on the desired hue or fill in the colour value and then click on “save”. Under the tab “logo” you can choose your logo which will be presented on the left side in the upper menu of your platform. It is also possible to set a start-up screen which will be seen on the home page. Please note that you have to upload pictures with the right size so that it is presented in the right way. Please fill in your legal notice by selecting the field “legal notice” under the menu item “page content“ . Now you can enter your imprint. You can also set your terms and conditions and privacy policies in the same menu. Choose the corresponding field and fill in your text. After that, click on the button “save” on the right side under the textbox. If you want to offer webinars, you should create categories in which you can sort the online seminars afterwards. Like this, you and other users of the platform have a better overview of your offer. 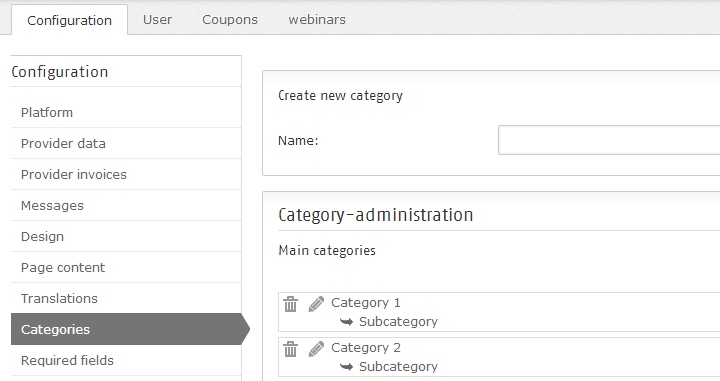 To create a category, go to the menu item “configuration” and then to “categories”. 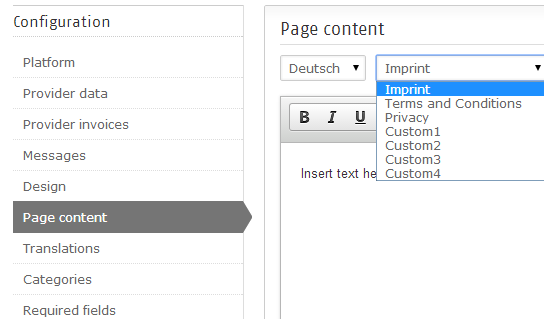 To create a main category, fill in the name of your desired category in the text field on the page which is now shown to you. Click on “create” and the category will appear in the overview. If you want to create a subcategory to this main category, click on the main category and in the next step you can enter the title of your subcategory in the text field. Click again on the button “create” to finish the process. To change the name of a category afterwards, click on the pencil icon on the left side of the name. Change the name in the presented text field and click on “save”. When you click on the dustbin icon you can delete created categories. Besides, you can set the order of the categories by clicking on a main category, hold it while moving and pull it to the desired place.